Hats off, gentleman — hats off. I can say with certainty that this is the best roller bag ever made. Why this particular bit of genius hasn’t caught on, I can’t imagine. Possibly because, like those who ride the accursed Segway, riders of this contraption would give off a certain “punch me” vibe. And yet, one can’t entirely suppress the feeling of wanting to switch places with them, if only for a moment. Shameful, but understandable. 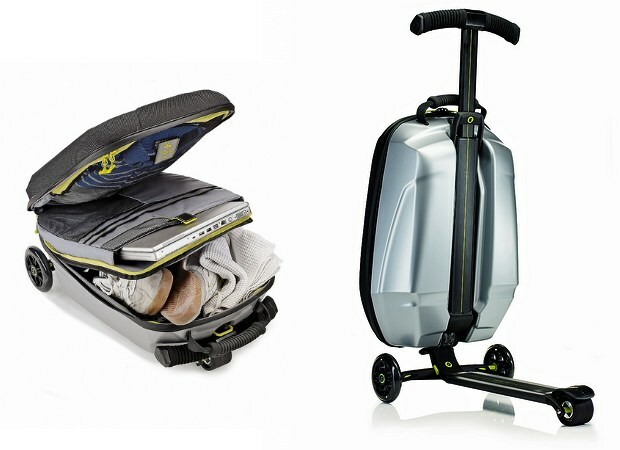 The Trolley Scooter from Samsonite und Micro Mobility is the perfect tool for bloggers like myself who, at trade shows like CES, must walk miles (miles!) with packs full of gear just to bring you guys the freshest news. I’d rather scoot. I’d rather scoot than do most things, to be perfectly honest. No price is given and I can’t find it on Micro Mobility’s site, but I would ballpark its cost at around 100€ — $120 or thereabouts.